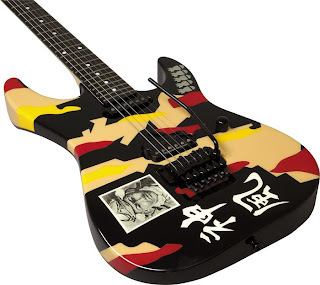 Obviously, this is a shredding-quality rock guitar. It sounds incredible, mostly due to the electronics sound package. The bridge position pickup is a super-intense Seymour Duncan Screamin’ Demon, and the neck position is an ESP SH-100 single coil. There is a single push/pull pot for the pickups. Simple. The other component of the hard-edged sound of this guitar is that it has a solid 2-inch maple body. Not mahogany, alder or ash. Maple. Harder and heavier than hell, but worth it. The maple neck has 22 extra-jumbo frets on its ebony fretboard. The bridge is a genuine Floyd Rose double-locking tremolo model. All of the stock black hardware is there, and straplocks have been added. Good idea on those strap locks. It is a one-trick metal-god riding pony, so it did not stick around long. But it has the looks that make the girls’ knees go weak, and when it is plugged in babies cry and old ladies faint. The list price for this guitar is an astounding $3999, and Musicians Friend sells them for $2999. Pretty heady stuff, eh? But, if you are looking for a rock and roll monster this could be the guitar for you! By the way, I had the opportunity to meet George Lynch at a trade show last year. He was very personable, and was nice enough to spend some time chatting with me. And he is a damned nice-looking man. Are you selling this ESP?